Thank you for this great community you have! I've been reading this forum since looong before buying myself a lovely second-hand Peugeot iOn, and it sure made the difference choosing my first EV! Using caniOn I then notice the batteries start to heat too much, and still no AC. I hear this is no usual behaviour, and the AC should stay until the end of the charge. 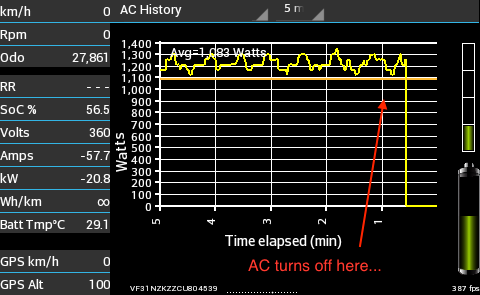 Any clue of what may be wrong (if it is wrong at all) with my AC? I took some screenshots of caniOn during the latest fast charge. 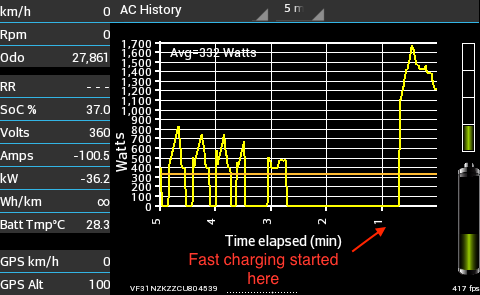 This is the first picture, where we can see the AC turning ON a few seconds after starting the fast charge. pancello, welcome to the forum and thank you for your kind words. Thank you also for your descriptions and CaniOn screenshots. The AC behavior you are experiencing is perplexing, but also quite common. Many of us have noted it, and do not understand why Mitsubishi would prematurely stop the battery cooling. IIRC, there was some effort to remotely turn on the fan inside the battery pack but I couldn't find the posts and I don't believe it was successful. There is at least one thread discussing mods for redirecting the AC air directly into the battery pack - but, unfortunately, the AC could not be run while the car is charging. Mine does it, too, but usually around 66-67%, although lately it's developed a habit of cycling on/off rather quickly at this threshold before shutting down completely. Confusing, but apparently normal operation. So I now feel partly relieved and partly concerned... If it is normal behavior, at least it means nothing is damaged, and that's good! I just bought the car, and I wouldn't like to spend money fixing it already. Do you think this is worth a visit to Peugeot, anyway? Also I noticed sometimes the car takes a while to start up... And as much as I know, it uses the 12V battery to start. Could it be related? And the car just needs a new 12V battery? pancello wrote: ...Do you think this is worth a visit to Peugeot, anyway? Hi pancello, I personally am very reluctant to let anyone touch my i-MiEV unless absolutely necessary - your situation sounds 'normal'. In order for the service department to deal with your issue they would need access to a CHAdeMO charger - something I doubt they have. I would be fearful of their rummaging about, as there are probably very few technicians out there with i-MiEV/iOn/C-Zero experience. Will you be making many seriously-long hot summer trips whereby this would be a concern? Regarding the start-up time delay, it should pop into READY within about a second of turning the key to the START position, although some have noted a hiccup if they rush through that. In your shoes I would take my time and note the car's response until you're comfortable and can consistently activate the car. A low 12v battery would manifest itself with any number of different strange reactions - you might simply measure its voltage after the car has been sitting overnight to see if it's ok.
BTW, you might wish to update your location as we have forum members from all over the world. I don't know what is a seriously-long trip, but I'll be making some 5-6 fast-charge stops in a trip during this summer, and I expect about 30-40°C outside... I don't know either if four or five days per year with cells above 40°C is something I should worry about in terms of battery durability (providing I can stay below 33°C the rest of the year)? About the start up of the car, I think what happens is what you describe: I rush too much and the cat doesn't like it! 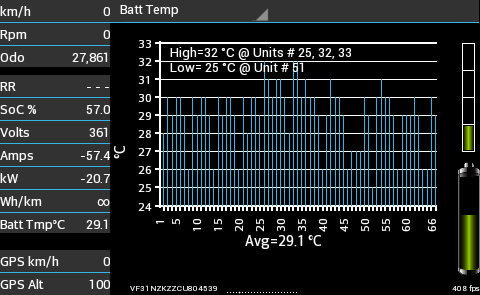 So I should probably discard problems with the 12v battery... I'll try to measure the voltage anyway just to be sure. pancello, we have another member from Portugal (Tábua), who goes by the name Malm, who has probably used/abused his battery more than anyone else on this forum. You might scan through his posts (he has many) and perhaps contact him? After all, you are only 140km from each other. Sure I "know" him from a Portuguese EV forum. He's the absolute hero! I'm happy to know that he is known here as well. I'm still on the process of reading his "diary" on that forum, which has more than 200 pages! I learnt so much reading it that I will never be able to thank him enough. I have seen the same behavior from the AC during DCQC. From watching individual cell temps on Canion I think it has to do with the disparity between cooler and warmer cells. As we know the cell cooling is far from uniform in the pack. Seems that my AC shuts down when the difference between the warmest and coolest cell censor is about 18F. This does make some sense from a battery balance and longevity standpoint. Nothing definitive just an observation . Perhaps other interested parties can watch theirs from the same perspective and see if it holds water? ?